Visa-exempt foreign nationals (max 90 days): Benin, Burkina Faso, Cape Verde, Ivory Coast, Gambia, Guinea, Guinea-Bissau, Kenya, Liberia, Mali, Mauritius (60 days), Niger, Nigeria, Rwanda, Senegal, Sierra Leone, Singapore, Swaziland, Togo, Trinidad and Tobago (60 days), Lesotho, Malawi, Namibia, South Africa, Tanzania, Trinidad and Tobago, Uganda and Zimbabwe. Special passports: Holders of diplomatic, official, or service passports issued to nationals of Brazil, China, Cuba, Germany, Equatorial Guinea, Iran do not require a visa for Ghana. Holders of passports of Regional Economic Communities in Africa and the African Economic Community United Nations and its Specialized Agencies (The World Bank,	African Development Bank) do not require a visa for Ghana. 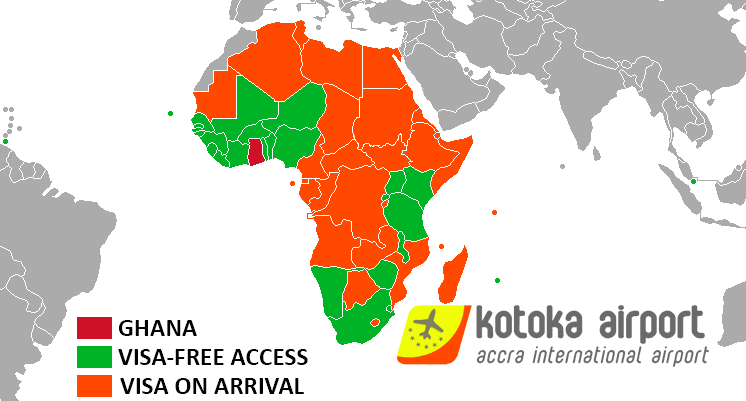 Visa on arrival: From 1 July 2016 citizens of the African Union (except Morocco) member states that are not visa exempt can obtain a 30 days maximum visa for Ghana upon arrival for fee $150. The arrangement would be piloted at the Kotoka International Airport in Accra for three months, and thereafter extended to all other entry points of the country. If special requirements are satisfied, the citizens of countries without diplomatic or consular mission of Ghana travelling on short notice may obtain a visa on arrival. Visa is granted on arrival for holders of a copy of a pre-arranged approval from immigration. Transit visa: all persons in direct airside transit are exempt from visa requirements. Nationalities subject to visa: citizens of all other nationalities can obtain their visa in embassies or online. 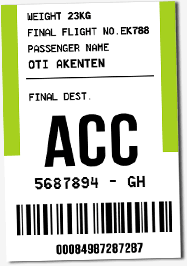 Note: a passenger who does not have Ghanaian identity papers (passport or identity card) is considered as a foreign passenger even if he / she has a multi-citizenship. Standard procedure in embassies: the different types of visa are generally obtained in the Ghanaian diplomatic representation closest to you. Visa on arrival: From 1 July 2016 citizens of the African Union (except Morocco) member states that are not visa exempt can obtain a 30 days maximum visa for Ghana upon arrival for $150. If special requirements are satisfied, the citizens of countries without diplomatic or consular mission of Ghana travelling on short notice may obtain a visa on arrival. Visa is granted on arrival for holders of a copy of a pre-arranged approval from immigration. Online visa application: residents of some countries have the option to apply for an online visa and pay with their credit card. * Conditions for obtaining visas, fees and concerned nationalities change regularly. Please check systematically which requirements you are subject to.